Real-world behavioral tests are an effective way to better understand your customers and optimize your conversion rates. But for this testing to be effective, you must make sure it is accurately measuring customer behavior. One reason these A/B split tests fail to give a correct representation of customer behavior is because of validity threats. This series of checklists is designed to help you overcome Instrumentation Effect. It is based on actual processes used by MECLABS Institute’s designers, developers and analysts when conducting our research services to help companies improve marketing performance. Avoiding Instrumentation Effect is even more challenging for any test that will have traffic from mobile devices (which today is almost every test). So, to help you avoid the Instrumentation Effect validity threat, we’re providing the following QA checklist. This is not meant for you to follow verbatim, but to serve as a good jumping-off point to make sure your mobile tests are technically sound. For example, other browsers than the ones listed here may be more important for your site’s mobile functionality. Maybe your landing page doesn’t have a form, or you may use different testing tools, etc. Of course, effective mobile tests require much more than thorough QA — you also must know what to test to improve results. If you’re looking for ideas for your tests that include mobile traffic, you can register for the free Mobile Conversion micro course from MECLABS Institute based on 25 years of conversion optimization research (with increasing emphases on mobile traffic in the last half decade or so). There’s a lot of information here, and different people will want to save this checklist in different ways. You can scroll through the article you’re on to see the key steps of the checklist. Or use the form on this page to download a PDF of the checklist. The following checklists are broken out by teams serving specific roles in the overall mobile development and A/B testing process. The checklists are designed to help cross-functional teams, with the benefit being that multiple people in multiple roles bring their own viewpoint and expertise to the project and evaluate whether the mobile landing page and A/B testing are functioning properly before launch and once it is live. For this reason, if you have people serving multiple roles (or you’re a solopreneur and do all the work yourself), these checklists may be repetitive for you. Dev Team – These are the people who build your software and websites, which could include both front-end development and back-end development. They use web development skills to create websites, landing pages and web applications. For many companies, quality assurance (QA) would fall in this department as well, with the QA team completing technical and web testing. While a technical QA person is an important member of the team for ensuring you run valid mobile tests, we have included other functional areas in this QA checklist because different viewpoints from different departments will help decrease the likelihood of error. Each department has its own unique expertise and is more likely to notice specific types of errors. Value in QA: The developers and technological people are most likely to notice any errors in the code or scripts and make sure that the code is compatible with all necessary devices. Project Team – Depending on the size of the organization, this may be a dedicated project management team, a single IT or business project manager, or a passionate marketing manager keeping track of and pushing to get everything done. It is the person or team in your organization that coordinates work and manages timelines across multiple teams, ensures project work is progressing as planned and that project objectives are being met. Value in QA: In addition to making sure the QA doesn’t take the project off track and threaten the launch dates of the mobile landing page test, the project team are the people most likely to notice when business requirements are not being met. Data Team – The data scientist(s), analyst(s) or statistician(s) helped establish the measure of success (KPI – key performance indicator) and will monitor the results for the test. They will segment and gather the data in the analytics platform and assemble the report explaining the test results after they have been analyzed and interpreted. Value in QA: They are the people most likely to notice any tracking issues from the mobile landing page not reporting events and results correctly to the analytics platform. Design Team – The data scientist(s), analyst(s) or statistician(s) helped establish the measure of success (KPI – key performance indicator) and will monitor the results for the test. They will segment and gather the data in the analytics platform and assemble the report explaining the test results after they have been analyzed and interpreted. Use the Pixel Perfect Overlay function in Firefox Developer Tools – The purpose of this tool is to take an image that was provided by the designer and lay it over the website that was produced by the developer. The image is a transparency which you can use to point out any differences or missing elements between the design images and the webpage. Displaying of images – Make sure that all images are displaying, aligned and up to spec with the design. Forms, List and Input Elements (Radio Buttons, Click Boxes) – Radio buttons (Dots and Circles) and Checkboxes (Checks and Boxes) are to be tested thoroughly as they may trigger secondary actions. For example, selecting a “Pay by Mail” radio button will sometimes automatically hide the credit card form. Margins and Borders – Many times, you will notice that a portion of the body or perhaps a customer review or image is surrounded by a border or maybe even the whole page. It is our duty to inspect them so that there are no breaks and that they’re prominent enough for the user to decipher each bordered section. Copy accuracy – Consistency between typography, capitalization, punctuation, quotations, hyphens, dashes, etc. The copy noted in the webpage should match any documents provided pertaining to copy and text unless otherwise noted or verified by the project manager/project sponsor. Font styling (Font Color, Format, Style and Size) – To ensure consistency with design, make sure to apply the basic rules of hierarchy for headers across different text modules such as titles, headers, body paragraphs and legal copies. Verify reporting within the test/analytics tool where possible – Success metrics and click tracking in Adobe Target, Google Content Experiments, Google Analytics, Optimizely, Floodlight analytics, email data collection, etc. Make sure links go where supposed to, fields work as expected, data passes as expected from page to page. Is there an extremely strict adherence to brand standards? Does it impact the hierarchy of the page information? Does it appear broken/less credible? To download a free PDF of this checklist, simply complete the below form. 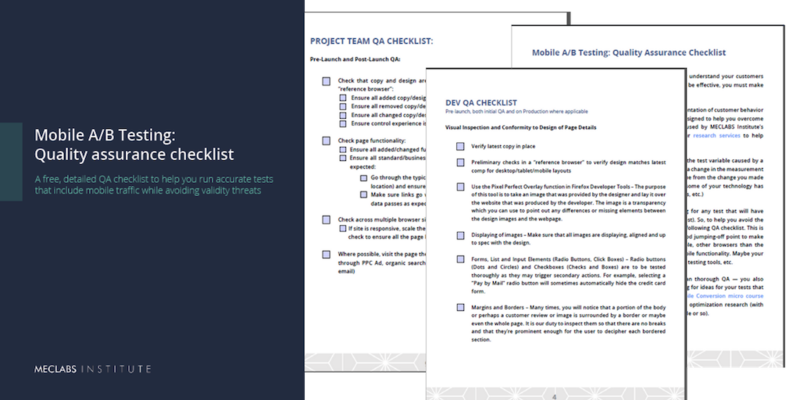 Hopefully, this Mobile QA Checklist helps your team successfully launch tests that have mobile traffic. But you still may be left with the question — what should I test to increase conversion? 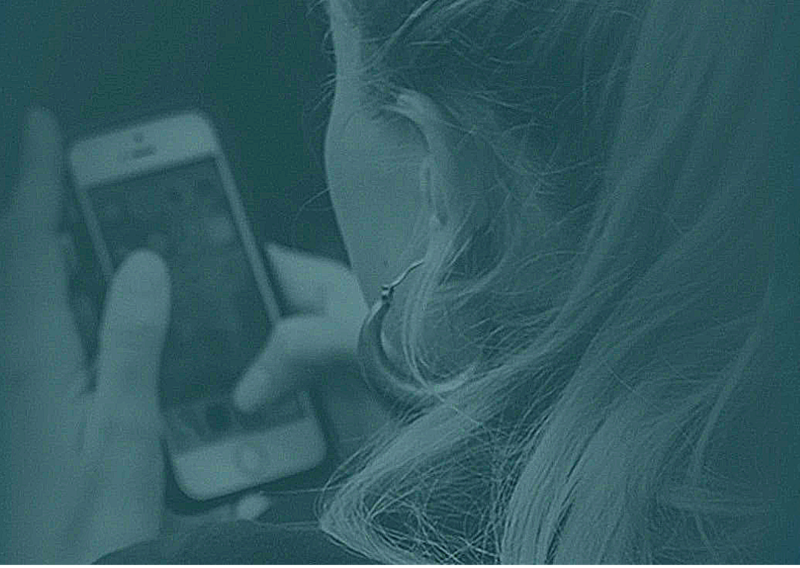 MECLABS Institute has created five micro classes (each under 12 minutes) based on 25 years of research to help you maximize the impact of your messages in a mobile environment.